When I take groups of travelers to Italy, my little heart pitter-pats when I hear, “I would never have known about this!” So, when Kimba at Artist-at-Large tagged me in Tripbase’s Best-Kept Secret carnival, I was thrilled. What good is a secret if you never tell anyone, right? 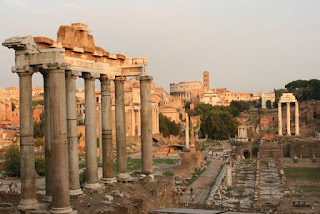 Rome is not a cheap city, but many travelers make the mistake of staying far on the city’s outskirts and traveling in to the center each day to go sightseeing. The problem? They often spend hours and loads of dollars each day on taxis. In my book that money is far better spent choosing a hotel, apartment, or monastery near the city center. 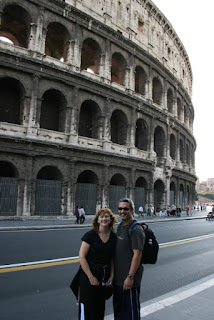 Most of the big attractions -- the Colosseum, the Forum, the Pantheon, the Vatican -- are easily accessible by public transportation or on foot from the city’s center. And a week-long transit pass can be purchased for about €11 at any tobacco store. It’s valid on every tram, bus, subway, and even some local trains in the area. My favorite neighborhood? Trastevere. I love the little pedestrian streets and the fantastic restaurants that populate this youthful area. And I’ve stayed in so many great apartments and hotels in the neighborhood that I just keep coming back. There’s a very convenient tram line that connects Trastevere with Largo Argentina and thus the rest of the city. Plus, it is quite a bit cheaper to stay there than, say, around the Pantheon. European cities offer a variety of passes that bundle entrance fees together in one package. Some are good. Some are not. I think Rome’s Archaeological Card is one of the best values in Italy. First off, do not confuse the Archaeological Card with the Roma Pass. They are two different creatures. The Archaeological Card is designed for visitors headed to Rome’s great ancient attractions, but even visitors who aren’t going to visit all 40 (yes, you read that right) sights that are included, will find value. The card includes full admission to some sites and offers discounts at others. A full information packet is included with the purchase of the card. If you use the pass to get into the Colosseum and just one other site, you will have more than paid for the pass. And here’s the beauty of the Archaeological Card: it allows you to skip the lines at the Colosseum! The easiest place to buy the Archaeological Card is at the entrance to the Palatine Hill -- just across from the entrance to the Colosseum. There’s never a line at that ticket entrance, and it is just a quick walk away. You’ll also find the Archaeological Pass at most tourist offices, too. The pass is valid for 7 days from the date it is first used. Tourists in Rome often get sucked in by package trips to Pompeii and return hot, tired, and disappointed. Pompeii is nearly 4 hours by bus from Rome -- each way. And most bus trips are there and back in a day. Personally, unless you’re going to spend some time in Naples, I have a much better idea: head for the seaside ruins of Ostia Antica. Ostia Antica was the port city for Ancient Rome. All ships stopped at Ostia and unloaded their cargo onto barges which then sailed up the Tiber into the capital city. When the Tiber changed course, Ostia was buried under silt and beautifully preserved for millennia until it was rediscovered during the Renaissance. Many of the gorgeous mosaics and sculptures found in the Vatican and other Renaissance palaces came from Ostia, in fact. Today, Ostia Antica is an archaeological park that stretches for acres and acres. The ancient streets now serve as walking paths -- still marked by the grooves of chariot wheels. Visitors can picnic in the amphitheater and the brave try out the excellent acoustics with a live performance. The city hosted several synagogues, Christian churches, a fabulous Mythraum, and a variety of Roman temples -- and they are all still standing. Look for the frescoes in the baths and the gorgeous mosaic floors at the gymnasium. Take a train out from the Piramide station in Rome. Cost: €1 each way -- but if you buy a Metro ticket, that will take you there and back at no extra cost. Get off at the Ostia Antica station (30-45 minutes away). Follow the signs across the overpass and down Via della Stazione di Ostia Antica, through the parking lot, to the green ticket booth and entrance. The ticket booth also sells maps which are helpful on a first visit as most guidebooks don’t include Ostia Antica. Entrance fees: €6.50 per person. Pack a picnic in your backpack. There is a small cafeteria near the park’s museum, and you’ll find restrooms both there and outside near the entrance. But a picnic is cheaper, and the park is a glorious place for a picnic. The entire park is outdoors, so it is best to go on a pretty day. And wear good walking shoes as the terrain is rough. When you're done at the park, hop back on the train and go one more stop to Ostia proper. It's a seaside town with lovely beach access not too far from the train station. Dip your toes in the Mediterranean for me! 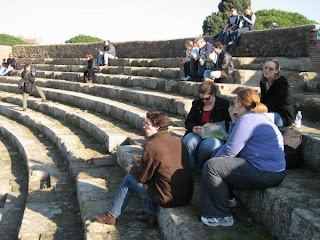 Good tips - I do love Ostia Antica. When we went there in October, i think we were the only people for miles around. WHAT a great list!! you make me want to go, for sure. i esp love picnics, from local markets - can't beat it! Great Tips. 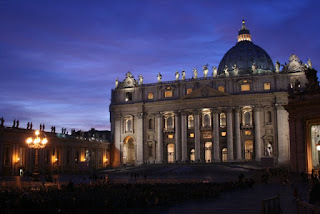 you can also save money on accommodation in the centre of Rome by staying in a monastery or convent. a friend recommended I try one and I found a good site www.monasterystays.com. It is an on-line booking service and has heaps of places in central Rome. Lots with single rooms and they are safe. I'm using them on my trip to Sicily in February next year. Sigh. You single-handedly just made me miss Roma 100x more than I already did. I loved all these tips. Pompeii was really cool, but you're right- it's best done when you get to surround it with other great places like Capri and Positano! Ostia Antica was really cool too! Super tips for Rome, thanks for sharing! I have never heard of Ostia Antica. Thanks for the tip.